Social and emotional learning is essential to every child’s education. SEL is more than just a program or lesson. It is about how teaching and learning happens, as well as what you teach and where you learn. SEL involves cultivating caring, participatory, and equitable learning environments and using evidence-based practices that actively involve all students in their social, emotional, and academic growth. The goal is to prepare students for long-term success in life and to become responsible, caring members of our multicultural society. The most effective way to promote SEL infuses social and emotional learning into every part of students’ daily lives — across all of their classrooms, during all times of the school day, and when they are in their homes and communities. This requires a coordinated, systemic approach between district leaders, principals, teachers, families, community partners, and other stakeholders. What competencies do SEL promote? CASEL identifies five core competencies that help children and adults navigate the world more effectively. Self-awareness: Recognizing one’s emotions and thoughts and their influence on behavior. This includes accurately assessing one’s own strengths and limitations and biases, and possessing a well-grounded sense of confidence, optimism and growth mindset. Self-management: Regulating one’s emotions, thoughts, and behaviors effectively in different situations. This includes managing stress, controlling impulses, motivating oneself, and setting and working toward personal and academic goals. Social awareness: Taking the perspective of and empathizing with others from diverse backgrounds and cultures, understanding social and ethical norms for behavior, and recognizing family, school, and community resources and supports. Relationship skills: Establishing and maintaining healthy and rewarding relationships with diverse individuals and groups. This includes communicating clearly, listening actively, cooperating, resisting inappropriate social pressure, negotiating conflict constructively, and seeking and offering help when needed. Responsible decision-making: Making constructive and respectful choices about personal behavior and social interactions based on consideration of ethical standards, safety concerns, social norms, the realistic evaluation of consequences of various actions, and the well-being of self and others. What role do school districts play in promoting SEL? In partnership with schools, families, and communities, districts play a critical role in supporting young people’s social and emotional development. This goes beyond rolling out an SEL program to embedding SEL into every aspect of the district’s core work. 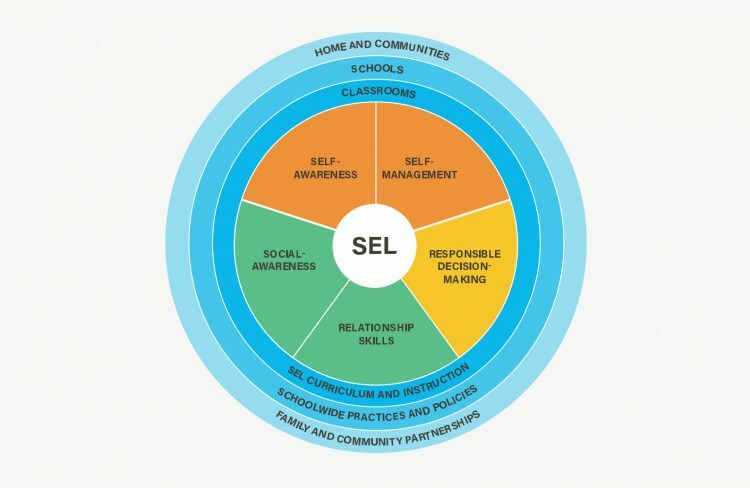 Where does SEL take place? Classrooms: Nurturing, safe classrooms with caring teacher-student relationships are critical to SEL. These types of supportive classrooms depend on adults who themselves have strong SEL skills (Jones et al, 2013) and can effectively use evidence-based strategies for developing students’ social and emotional competencies in culturally responsive and developmentally appropriate ways. These strategies include explicit SEL instruction, embedding SEL into academics, and elevating student voice. Schools: Students interact and learn not only in classrooms but throughout school hallways, cafeterias, playgrounds, school buses, etc. A school’s policies, procedures, physical structures, collective values, norms, relationships, and overall climate all shape how students engage in SEL. Additionally, research indicates that school leadership that models, supports, and prioritizes SEL may be the single most important factor for the successful implementation of SEL programs (Devaney et al., 2006). Homes: Students are better able to learn and apply SEL knowledge when it is practiced and reinforced both in the school and the home. When schools and families cultivate authentic partnerships, SEL programs are more effective (Albright & Weissberg, 2010; Patrikakou & Weissberg, 2007) and are linked to improved academic performance, increased student engagement, and reduced school dropout rates (Greenberg et al., 2003). Communities: Community partners and organizations can work jointly with schools to align efforts, contribute to SEL, and strengthen the impact of SEL both in and out of school (CASEL, 2015; Durlak, 2010; Elias et al., 1997; Oberle et al., 2016). Similarly, schools can expand upon the efforts of community partners that focus on social and emotional learning by reinforcing effective strategies during the school day. What does the research say about SEL? Improves the school environment, which results in better social and academic outcomes for students. An evaluation of CASEL’s Collaborating District Initiative (CDI)—a multiyear, systemic SEL initiative in multiple school districts—showed a variety of positive outcomes both for the school as a whole (improved climate and increased attendance) and for students (academic performance, social and emotional competence, and fewer disciplinary referrals) (CASEL, 2017). Helps schools coordinate diverse services and programs (Elias et al., 2015; Oberle et al., 2016). 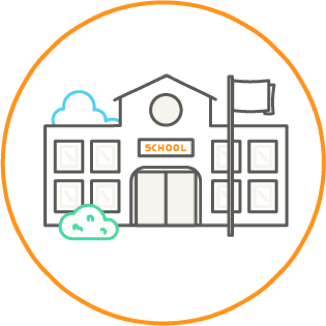 Schools typically tackle many in-school and out-of-school programs aimed at prevention (e.g., substance abuse prevention, bullying prevention) and promoting student achievement and well-being. When fragmented, this kind of programming demoralizes staff and impairs student learning (Elias et al., 2015). Systemic SEL provides a framework to coordinate existing programs into one initiative with a common infrastructure, vision, and language. Ensures students experience SEL in a consistent and coherent way. Students learn and apply social and emotional competencies more rapidly and effectively when the messages they receive across settings are aligned and mutually reinforcing. A systemic approach to SEL brings all of the developmental agents in a student’s life together to teach, learn from, and communicate with one another. Promotes cultural responsiveness through authentic partnerships with families and community partners, who play key roles in supporting students’ academic, social, and emotional development (Chartock, 2010; Delgado-Gaitan & Trueba, 1991; Hollins, 1996). CASEL’s widely used framework identifies five core competencies that when prioritized across settings – districts, schools, classrooms, families, and the wider community – can educate hearts, inspire minds, and help students navigate the world more effectively.